In recent blogs, we outlined medical Medicare review strategies; explained probe and educate (PE), as well as Targeted Probe and Educate (TPE), Medicare’s new medical review strategy; we offered strategies for preparing and submitting TPE documentation; and we outlined the TPE claims review process. In this blog, we will share some of the top hospice agency TPE denial reasons. To better educate you on TPEs, it’s instructive to know about the top hospice TPE denial reasons. Below, we’ve outlined the top 5 from October-December 2017 as ranked by CGS Administrators, LLC (CGS), along with potential remedies for each. Following these, we also included the top hospice medical review denial as ranked by Palmetto GBA, which, along with CGS, is one of the nation’s largest Medicare Administrative Contractors (MACs). (1) Denial code: 5PM01: Information provided does not support a terminal prognosis of six months or less. Have remained on the hospice benefit for a long period of time. Have chronic illnesses with a more general decline. Documentation to support terminal prognosis should be objective and include quantifiable values/measures (e.g., pounds, 4 on a scale of 1-5, inches). Documentation must “paint a picture” of the patient, the conditions and symptoms which support a life expectancy of six months or less. (2) Denial code: 5PC09: The hospice plan of care does not meet the requirements set forth in the code of federal regulations. Must be reviewed and updated by the Interdisciplinary Group (IDG) at intervals specified in the POC, but no less frequently than every 15 calendar days. Should continually be assessed to ensure that the care the beneficiary receives meets their conditions and needs. When revised, must include information from the patient’s updated comprehensive assessment and must note the patient’s progress toward outcomes and goals specified in the POC. Should be updated if the beneficiary’s condition improves or deteriorates, and when the level of care changes. Will include an assessment of the individual’s needs and identification of the services, including the management of discomfort and symptom relief. Must state in detail the scope and frequency of services needed to meet the beneficiary’s and family’s needs. Acts as a roadmap for the IDG to provide consistent, cohesive care, and will support the medical necessity of hospice care. (3) Denial code: 5PC08: Face-to-face encounter requirements not met. The physician/Nurse Practitioner (NP) conducting the Face-to-Face (FTF) must gather and document clinical findings to determine continued hospice eligibility. If the hospice NP/non-certifying physician performs the FTF, they must share the clinical findings with the certifying physician. The NP cannot sign the recertification, even though she/he provided the FTF. The physician/NP who performs the FTF encounter must attest in writing that he or she had the FTF encounter, including the date of the visit. When an NP performs the FTF, the attestation must also state that the clinical findings were provided to the certifying physician. The FTF attestation must be signed and dated by the individual who performed the visit and must be a separate distinct section of the certification, or a clearly titled addendum to the certification. If the patient, in a third or later benefit period, transfers to another hospice, the receiving hospice is not required to do a FTF for the benefit period if it can verify the FTF was provided by the previous hospice. The written certification, including the narrative and FTF, must be signed prior to billing the claim. Hospice certifications may be completed up to 15 days prior to the effective date of the election and each subsequent benefit period. Hospice certifications/recertifications must contain the dates of the benefit period. The FTF visit is an administrative component of the recertification process and not separately billable. If medically necessary professional services are provided, such as symptom management, this component can be billed on the hospice bill. (4) Denial code: 5PC01: The physician narrative statement was not present or was not valid. As of Oct. 1, 2009, the physician’s brief narrative explanation of the clinical findings that supports a life expectancy of six months or less is part of the certification and recertification forms, or is an addendum to the certification and recertification forms. The narrative shall include a statement directly above the physician signature attesting that by signing, the physician confirms that he/she composed the narrative based on his/her review of the patient’s medical record or, if applicable, his or her examination of the patient. The physician may dictate the narrative. The narrative must reflect the patient’s individual clinical circumstances and cannot contain check boxes or standard language used for all patients. The physician must synthesize the patient’s comprehensive medical information in order to compose this brief clinical justification narrative. (5) Denial code: 5PX06: The notice of election is invalid because it doesn’t meet statutory/regulatory requirements. Identification of the hospice agency that will provide the care. The effective date of the election. Note: This date can be the first day of hospice care, or a later date, but cannot be a retroactive date. The patient’s/representative’s acknowledgement of their understanding of hospice care, particularly that hospice care is palliative, not curative. The patient’s/representative’s acknowledgment that they understand certain Medicare services are waived by the hospice election. The signature of the patient or their representative. The patient’s/representative’s designated attending physician (if they have one). Include enough detail to clearly identify the attending physician. This may include, but is not limited to, the physician’s full name, office address, or National Provider Identifier (NPI). The patient’s/representative’s acknowledgment that the designated attending physician was their choice. *Palmetto GBA top denial code: 56900: auto denial – requested records not submitted. Medical records were not received in response to an ADR in the required time frame; therefore, we were unable to determine medical necessity. Failure to submit requested documentation will result in a denial 100% of the time. Monitor your claim status on Direct Data Entry (DDE). If the claim is in status/location SB6001, the claim has been selected for review and records must be submitted. Aim to submit medical records within 30 days of the ADR date. The ADR date is in the upper left corner of the ADR request. The claim will auto deny on day 46. Gather all information needed for the claim and submit it all at one time. Submit medical records as soon as the ADR is received. Attach a copy of the ADR request to each individual claim. If responding to multiple ADRs, separate each response and attach a copy of the ADR to each individual set of medical records. Ensure each set of medical records is bound securely so the submitted documentation is not detached or lost. Do not mail packages C.O.D. ; they cannot be accepted. Return the medical records to the address on the ADR. Be sure to include the appropriate mail code. This ensures your responses are promptly routed to the Medical Review Department. TPE notifications are posted in the DDE system at the fiscal intermediary. To ensure timely notification of TPE requests, your hospice agency should regularly check the DDE system because you only have 30 days to respond to a TPE. Your agency should also track the TPE requests and responses on a spreadsheet or grid that includes applicable deadlines for response. This not only helps your agency keep track of the status of TPE responses, but it will be useful if you choose to appeal any claims that are denied as part of a probe. By submitting a cover letter highlighting the evidence that supports patient eligibility, your agency stands a better chance of avoiding claims denials and avoiding targeted medical review. The cover letter should be written concisely (approximately two pages in length) to make your agency’s case for patient eligibility during the claim period at issue. It should also point to documentation that supports your agency’s position. The terminal condition of a hospice patient will occasionally plateau, or even briefly improve, during a month. This does not mean that the patient is not terminally ill. In this case, it is helpful to provide documentation from claim periods outside of those requested on the TPE to show the trajectory of the patient’s disease, along with a carefully crafted cover letter explaining the information is relevant to the TPE period. Hospice agencies sometimes make the mistake of ceasing billing when they find themselves in the midst of a probe. However, this will simply prolong the probe because as discussed above, the intermediary will need to pull billed claims in order to complete its probe. The irregular billing patterns may also raise additional questions with the intermediary. Do you have questions about TPE, or other clinical challenges? 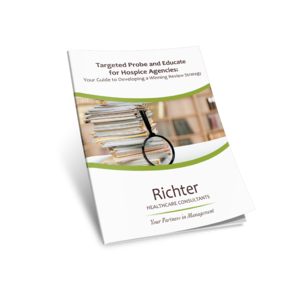 Read our Targeted Probe and Educate for Hospice Agencies e-book or call Richter’s clinical education consultants at 866-806-0799 to schedule a free consultation. Donna Berry is the Revenue Cycle Manager for Home Health and Hospice with Richter Healthcare Consultants.